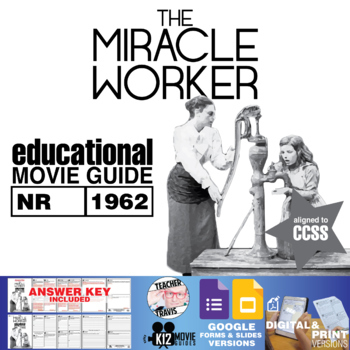 The Miracle Worker Movie Guide (Helen Keller Story) Worksheet (NR - 1962) gives students a glimpse into the extraordinary life and story of Helen Keller and Annie Sullivan. Explore the effectiveness of the disciplinary styles that Helen's family and Annie used. Ask students to think critically about how their life and experiences would be like without the senses of sight and hearing. Check the preview file for high resolution sample questions to see if this movie guide is suitable for your students. This resource consists of 12 high-level, short answer reflection and essay questions that will do more than just ask your students to regurgitate information. 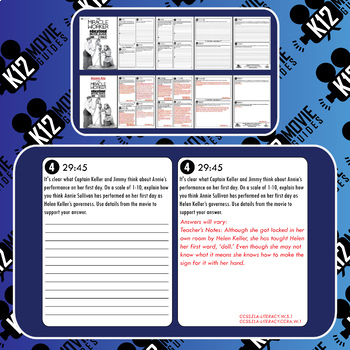 An answer key (5 pages) IS included with this movie guide, however many answers will vary as students are encouraged to construct their own meaning from the characters' dialogue and behavior. Earn Free Money with TPT Credits! Preview the next question on the movie guide as you complete each one, this can help students pay attention to important upcoming events. Pause at the times designated on the movie guide, encourage students to debate, discuss and talk about their ideas before writing their answers. Discourage students from simply copying answers. Randomly choose a student to share their answer and defend it if necessary. If time allows, feel free to rewind and show important parts of the movie again for additional analysis. 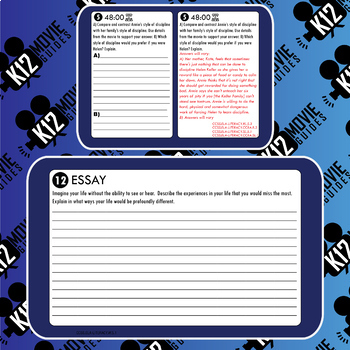 After completing the short answers, allow 5-10 minutes for each essay question at the end of the film. On average, this movie guide will require about 45-60 minutes in addition to the length of the movie. Ask students to download a PDF editor app if they don't already have one. It needs to have a save function as well. I used Foxit PDF. Host the file. I used google drive to share a folder with students. Get a feel for my work and see if this resource is right for you. I ask questions that require students to 'live' on the higher levels of Bloom's taxonomy.